We’ve noticed an unusually agressive ad campaign for the new P903iTV phone from Panasonic over the last few weeks. This latest handset, which was released in late February as the follow-up to the Japan’s original 1Seg. 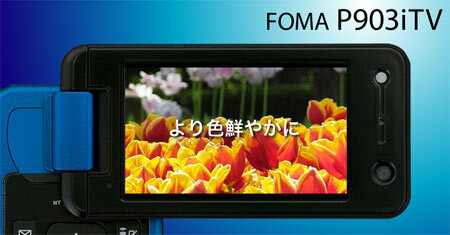 digital tv debut unit for DoCoMo, touts an improved “vibrant screen” display. Like Sony with the Bravia line or Sharp’s trendsetting Aquos brand before them, Panasonic has based this product on the same “PEAKS” processor technology used with their home television offering. Check-out this video from their website which is running here in prime-time TV slots. From the specs. offered this swivel screen design unit, with a color display of 262.144 colors, has ambient light and color correction packed into its 2.8-inch WQVGA (240×400 pixels) TFT liquid crystal display. The battery can run up to 5-hours of broadcast viewing and it comes complete with Felica for mobile commerce, bluetooth and a 3.2 mega-pix camera. More details [in Japanese] via the DoCoMo product page and a few extra video clips from Panasonic to simulate the improved resolution.